He was born on November 23, 1993 in Gunsan (North Jeolla province). He has a brother who is five years older than him. He moved to USA when he was 12 years old and came back to Korea at the age of 17. 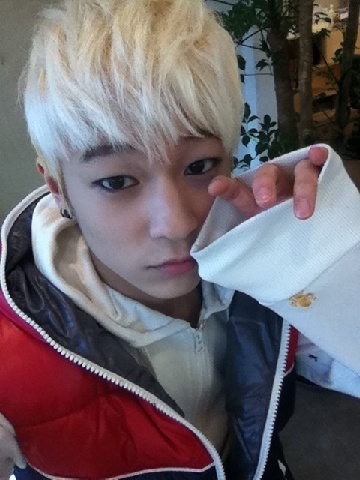 He received the name “L.Joe” from his friends in the United States. L stands for Lee. He was a model student and got A's. His dream was to be a doctor specialized in cardiothoracic surgery. He has played piano for about five years and has a lot of interest in composing songs. He often look at the mirror to look for the perfect angles in showing his expressions on stage. During the audition, he rapped to his own song and also a song by Epik high and Dynamic Duo. He said that he prefer to be a couple with Chunji instead of Ricky. Because Chunji can sing as well. He promised the other five members that he would write each of them a song. He said that Ricky was the one who welcomed him warmly when the first time he went to the practice room. can i copy this and i will credit to your blog. baby joe so cute..
Well, since in a large group of people, aound every 1 in 13 people will have the same birthday as you, and over 17,000,000 people were born on the same day, and there are only 9 degrees of separation between any 2 people on Earth, it doesn't seem like a co-incidence at all. In fact, it seems very expected and not at all special. Conidering that almost everyone is into music and like to think of themselves as creative, your Numerologist, like all scam artists, chose such general characteristics that they would have had to apply to you. Nothing unusual there, either. I suppose you would even consider it "amazing" that both of you have one head, too, right? L.Joe lived near me in the US. I miss him a lot. We used to sleep together. He's a hot little number, for sure. He doesn't like girls much, though.
" We used to sleep together "
Are you kidding me?! You sound really desperate and and idoit. you sound like an idiot .. " We use to sleep together "
You probably never even met him, so please shut up and making up lies on the internet because you sound really desperate. And guess what? I'm Byunghun's cousin. We used to go to each other's house pretty often back when he lived in the States. Though he's now in Korea while I still live in the States, we still call each other every now and then. I miss him alot too. Woah, really? You're his cousin? :) I would like to hear more about l.Joe. please? We have a lot in common..
who's the girlfriend of L.joe? PLZ LOVE TEENTOP! THEY ARE AWESOME!